Dorota Zelazny (39), London, UK. 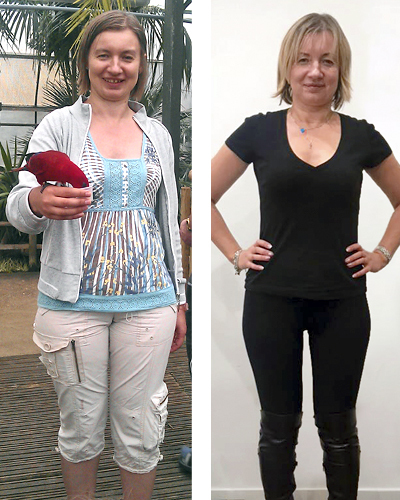 “Since I turned 30, my body started changing and I started putting on weight. I became more and more unhappy with myself. My weight reached 67-68 kg (dress size 14) and I did’t feel myself. I was working at Wormwood Scrubs as a prison officer. My role was to deal with prisoners on a daily basis. Responsibility for security, supervision and contributing to the rehabilitation of prisoners. Prior to this I was a support worker for people with learning disabilities and mental health issues. The stress of my job meant meal times with my family became compromised and I was snacking more and comfort eating to deal with my difficult job. I was a mess. In August 2013 I was off work for over 2 weeks and that’s when I discovered HYPOXI. I attended 3 sessions a week as recommended. There are some dietary restrictions with HYPOXI. It’s recommended to eat a small portion of carbohydrates 2-4 hours before the training and protein based diet after the treatment. I was very strict with myself and followed all the instructions. I didn’t do any other exercise. By the time I went back to work, I started seeing some results, such as wearing jeans I couldn’t wear before. Also my friends started complimenting me on how well I looked. This gave me the motivation I needed to start again. I had been at breaking point and this was my turning point. In total I lost about 10 kg within 6-7 weeks (dress size 8-10). Not only that, my lower body shaped up again, I managed to get rid of fat in stubborn areas, such as stomach & bum. It felt amazing and I started looking at the commercial side of HYPOXI, thinking it’s extremely rewarding and an amazing business opportunity. After many hours of overtime, negotiations with HYPOXI and 18 months later, I quit my job as a prison officer and opened my own HYPOXI-Studio at the end of January 2015. The studio is located now in 28 Chiswick High Road W4 1TE.